‘Getting to the cause of disease rather than just covering up the symptoms’Author Fred F Hollingsworth pops the lid off the Health Care Industry jar of problems with this informed approach to not only the politico-corporate barriers to sound health care that besiege our American Medical System, but also to the direction of emphasis on financial aspects of healthcare delivery we have been mislead to accept as de rigueur while the emphasis on the contra-lateral side might better be labeled sick care delivery. Dr. Fred began his professional career with degrees from La Verne College and USC in education, becoming an elementary school teacher then earning his PhD in Nutrition from the University for Nutrition Education that allows his counseling clients about health instead of submitting to life habits that lead to illness.The emphasis of this book is to reveal how corporate interests have blossomed in the field of health care delivery – on every level. The core of the message is directing light on health rather than illness, and Dr Fred spends extensive discussions on nutritional prevention or treatment of illness along with championing healthful living, not responding to illness with immediate demand for costly exams performed by costly new machines that are in many ways pushing the physician into the background as button pushers for scopes and robotic tools that prevent the sensitivity of hands-on doctor patient contact. Watch television commercials now and note how many advertised products are ‘new medications’ to heal - but check with your doctor first as they may cause serious consequences including death’. Expensive propaganda that misleads too many.Medical care (include preventative care and lifestyle health!) is a corporate and politically controlled insurance run carnival – and despite incidental programs that address health issues, just note the plethora of obese citizens, running from fast food snacks to Weight Watchers and fitness clubs – all very expensive modes of ‘re-gaining’ a healthy life. ‘Very powerful national and international financial interests have controlled healthcare for several decades. Their motive is mainly profit. Very little money is made by getting people well and keeping them well. Much money is made by keeping people sick but alive. The term "healthcare" is not actually correct. It should be called "sickness care". Doctors who attempt to use any unapproved lifesaving treatments to heal patients, face prosecution, the loss of their licenses, jail, financial bankruptcy, the loss of their health, and sometimes their actual physical safety.’And from this well documented stance Dr Fred discusses alternative medicine, orthomolecular medicine and complementary medicine. His driver is quality healthcare for everyone, affordable, sensible, non-invasive, and holistic in the finest sense of the term. One of the many fine chapters here discusses the history of The Great Healthcare War, illuminating and containing information we all should know. His discussion of cost and effectiveness of selected health products and therapies ignored or rejected by the medical establishment is revealing. ‘Education is the key to freedom. Otherwise people are victimized by propaganda…Every freedom loving person should belong to at least one health freedom organization.’This book is destined to be controversial – dismissed by many who are profiting from the persistence of sickness, embraced by the many who can no longer afford contemporary ‘healthcare’ and have learned alternative medicine. This is a solid book that deserves a place in every library – in homes, universities, medical schools and clinics’ waiting rooms. Only then will things change. Say what you want about the state of Health Care in America – it’s a hot potato. Politicians squabble and debate over it. People argue over it. Doctors shake their heads over it. And sick people keep getting sicker and deeper in debt. It’s a critical, emergency issue that needs to be addressed.In “Dr. 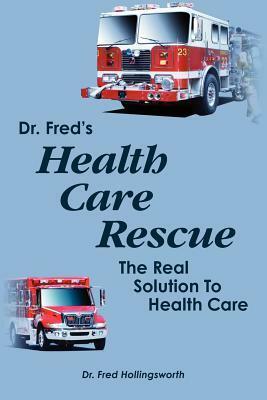 Fred’s Health Care Rescue: The Real Solutiion to Health Care,” Dr. Fred Hollingsworth gets straight to the heart of the matter analyzing why healthcare costs are “out of control,” suggesting possible cures to this problem and exposing some shocking details about what the author calls “tyranny” in the healthcare field. Dr. Hollingsworth’s states at the outset that he wrote this book “to explain how to provide much better healthcare in the U.S.A. at greatly reduced costs.” The author explains in simple, common sense language how to “reverse the out of control and upward spiraling costs” of healthcare by exposing the political and corporate interests that are doing so much damage. The author emphasizes how incredibly poor our “sick care” services are for the amount of money being spent, mainly because politicians and corporations are more interested in making money than keeping people healthy. It is by pulling back the curtain on a broken healthcare delivery system that Dr. Hollingsworth is able to identify a clear and concise fix for the problem.One of the keys, according to the author, is to focus more attention on keeping people healthy, often through alternative methods. Dr. Fred spends considerable time talking about how to incorporate preventative methods and alternatives to unnecessary and ineffective medical procedures. He discusses the lack of fair competition in the healthcare industry and shines new light on the old, dysfunctional medical establishment. He critiques costly exams by highly mechanized and expensive machines that push the doctor further away from the patient. He also has much to say about the pharmaceutical industries push for new, unnecessary medications that fail to heal us. Entire chapters are dedicated to Alternative medicine and treatment, Orthomolecular methods (altering the concentration of nutrients through vitamins and minerals), and just plain common sense ideas to decrease the amount of sickness in our society. He makes a solid case against doctors who use “unapproved lifesaving treatments” to prolong the life of a patient. Dr. Fred says these physicians should face prosecution and potential loss of their licenses to practice if they are caught doing this.This is a must-read book for anyone who is tired of the red-tape and complicated proposals to overhaul the healthcare system. It’s a perfect book for anyone who is interested in improving their own health so that they do not fall victim to the current health care trap. And “Dr. Fred’s Healthcare Rescue” is essential reading for anyone currently trying to make sense of the current healthcare quagmire in which the rich get richer and the poor stay sick. This is a very interesting and well researched book, in which the author considers the reasons and causes of the high cost of healthcare, and examines how to overcome this. He also talks about the lack of fair competition caused by repressed freedom, giving some very interesting examples. The author points out that healthcare could be provided much more effectively and cheaper if the authorities took advantage of the many little known therapies and treatments available instead of always opting for more expensive drugs and surgery. In chapter six he looks at the growing move towards alternative health care, complimentary, and orthomolecular medicines and how the importance of taking responsibility for your own health. Then in the next chapter he provides the reader with many examples of the hundreds of therapies, and treatments, which are available. Chapter four discusses some of the amazing advances which have been made, including the care of premature babies which affected me 29 years ago when I had my second child, a daughter at 26 weeks weighing .652 of a kilo. Now thankfully she is a competent health care professional. However it also points out that there have been failures along the way as well. It should be noted that the author does point out at the beginning of the book that he is not a licenced physician and the book is for information purposes only. I found chapter five very interesting since it dispels twenty-seven commonly taught and accepted beliefs such as the need for prescription drugs as the major basis for maintaining good health, egg consumption, whether margarine is better for you than butter, and whether the only solution to knee, hip, and other joint problems is replacement surgery. More than one of these fallacies took me by surprise.The author, Dr. Fred Hollingsworth, was born in southwest Colorado His life was profoundly influenced by his mother Gertrude, and grandmother, Anna Arkell. Anna had been taught by a Susan Anderson MD and the lifesaving lessons she learnt were passed on to him through her daughter Gertrude, (Fred’s mother). In the first chapter of his mother’s book Iodine Vision which was self-published in 1995, she tells of a profound experience which was to change her life totally, and also her sons, and ultimately lead to the writing of this fascinating book.